Turkish President Recep Tayyep Erdogan pressed the usual combination of emotive buttons guaranteed to intensify the pitch of war fever among packs of loyalists at the ruling Justice and Development Party (AKP) rally on Saturday, 27 January, in Kocaeli, a relatively short way from Istanbul. First, of course, he pushed the “religious” chord. The name he had chosen for the operation in Afrin was inspired by the word “olive” in the Quranic Surah “The Fig,” he said, hand on pietistic heart. He then tossed in a handful of expressions to stroke ethnic chauvinism, after which he fired a thirst for revenge against the horrors of terrorism that had struck Anatolia (regardless that no attacks ever emanated from Kurdish controlled cantons in northern Syria). All this he topped with the sure-fire use of “mehmetçik” (“little Mehmet”), the term of endearment for the ordinary foot soldier that fought in the Turkish battle of liberation following World War I. “Mehmetçik is marching to Afrin and soon, God willing, he will march to Idlib!” The crowd cheered. Several days before this he vowed that Manbij would be the final stage of the operation, the purported aim of which is to purge the whole of the northwest triangle of Syria of the separatist PKK, by which he referred to the Syrian Democratic Forces (SDF) and People’s Protection Units (YPG) which have been the US-led coalition’s chief and most effective ally in the war against the Islamic State (IS) group in Syria. To keep the sceptical few from imagining that all this was just playing to the gallery, he instructed his foreign minister to warn Washington to withdraw its troops from there. On the ground, however, the glorious march has been painfully slow. 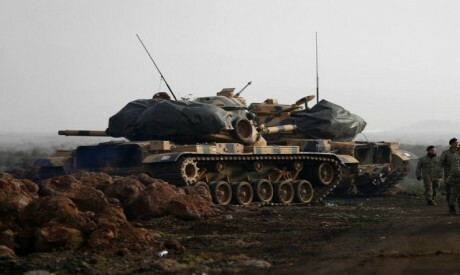 In spite of intensive air cover and massive bombardment, Turkish forces and their jihadist allies only managed to advance seven kilometres, allegedly, into the Afrin canton by 4 February, the 11th day of the invasion. Meanwhile, daily official updates, relayed verbatim by state controlled media, keep citizens posted on the progress: the numbers of terrorist (“PKK”) lairs destroyed and the numbers of enemy “combatants” killed (in the hundreds) versus the numbers of Turkish soldiers who were “martyred” (less than the fingers on a couple of hands). What is not said officially or, at least openly, is that the weapons the US had supplied the SDF/YPG in order to fight IS, strengthened the predominantly Kurdish forces and contributed to prolonging Erdogan’s cynically named “olive branch” operation which had been billed as a blitz campaign. The longer the campaign in Syria drags on the greater the risk of rising anger and frustration at home. The government may have succeeded in drumming up widespread support for its campaign to thwart the spectre of an autonomous Kurdish entity in northern Syria, but it is funnelling billions into its war budget at a time of mounting economic straits, a declining lira, dwindling foreign currency reserves, relatively high unemployment and higher inflation rates. It was therefore necessary to deflect the potential anger. So, government controlled media were mobilised into a fierce offensive against Washington’s policies in Syria and an army of columnists and talk show guests lashed out against US support of “terrorist militias” in northern Syria. The charges and recriminations against Washington have sent Ankara’s relations with its NATO ally to an all-time low, even worse than the previous nadir at the time of the Turkish invasion and occupation of northern Cyprus in 1974. Erdogan’s adviser and favourite opinion pundit continues to set the tune. “The US is now the nearest, the greatest and the most blatant threat to Turkey. It is an enemy country. It poses the most serious threat to our country’s existence and unity and to its present and future. It is waging an open attack against Turkey in an undeclared war,” writes Ibrahim Karagul in Yeni Safak, taking pains to highlight key words in bold to ensure that other media grasp the talking points. Incirlik Airbase in southern Anatolia has long been an important asset to the US-led coalition and to the Pentagon, in particular, in its fight against IS in Syria. Karagul urges his government to close that base to the US, “because ever since the war in Syria began, [the US] has directed terrorist organisations from that base and met with those organisations in that base”. The Turkish war fever is not restricted to pro-government circles. Significant segments of the opposition have chimed in, some to the extent of calling on the government to sever relations with the US. This helps explain Ankara’s current official tack towards Washington as manifest in the recent statements of Foreign Minister Mevlut Cavusoglu. The US must take some tangible action to prevent the mutual trust between the two countries from deteriorating further, he said. Therefore, in addition to creating a 30-kilometre buffer zone to “alleviate tensions” in Afrin, the US needed, above all, to “stop supporting terrorists” if it wanted to avoid a possible confrontation with Turkey in Syria. How far will Ankara go with this brinksmanship? Would it really risk a military clash with the US in the Syrian war theatre? Donald Trump might soften the tone of his rhetoric in order to appease Ankara but it is unlikely that Washington would abandon its Syrian Kurdish partners in the war against IS and Al-Qaeda-like jihadist militias in Syria. Ankara realises this and will probably try to reach some compromise. If it pushes too far, its tactics could backfire. Already US officials are citing international reports of mounting civilian deaths and internal displacement of peoples in Afrin, which had been one of the most peaceful and stable areas of Syria until the Turkish invasion. It appears, so far, that the Turkish road to Afrin will stretch on and on. If Erdogan wants to shorten the duration of the war, he may well have to do the unthinkable, which is to reach out to Damascus and negotiate with his sworn enemy, President Bashar Al-Assad.